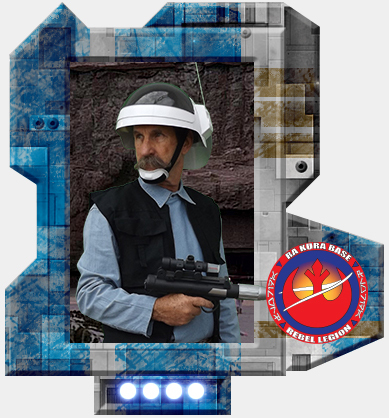 The iconic Rebel Fleet Trooper seen in ANH and later Rogue One. The helmet was bought online and I've very impressed with the quality and construction. The pants are German Military Surplus lightly dyed with gray dye. The shirt is a chambray blue utility shirt with the bib added to hide the buttons. Cuffs were removed along with the buttons and the sleeve was hemmed. The vest was custom sewn blending a combination of 3 sources since 1 definitive design could not be isolated. All pockets are functional but with no velcro, except for the lower back pocket. Satin black liner for a manufactured refined look. Boots are leather engineer boots. The belt, buckle and holster are all custom made and dyed. The DH-17 is a resin/PVC build we made years ago but never had a costume for.